Short Summary: Ender Wiggin is one of the many children bred to defend the human race against an alien race. When he leaves his family to train in a military leadership school, his loneliness and psychological battles gives him the strength that he requires to become a savior, leading other military bred boys to victory. My Review: Everyone I have ever talked to about this book has begged me to read it, saying it is the best book they have ever read, one of their favorites. However, it doesn’t even come close to being in my favorites list. Most of the book follows Ender’s strategic and “mock” fights with his military comrades, which meant that I was bored the majority of the book. I did like the few psychological tests that he was put through, but for the most part I skimmed through the story, waiting for the ending to be epic. Oh, was I disappointed… If you’ve read the book you will understand why the ending of it made me feel like reading this was the biggest waste of my time. If you haven’t read it, pick it up and let me know what you think once you get to the end and find out the truth about the military school, the mock battles, and the failures and victories of Ender. So, I liked it. Only liked it. Once again, I will suggest that anyone who loved this book, or who doesn’t want to waste their time, go read Molly Fyde by Hugh Howey. I was never into the Sci-Fi genre until Hugh’s series. 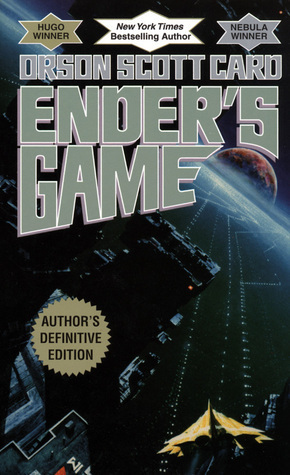 I was told that the series was ten times better than Ender’s Game, and had to read both before deciding. There it is. I really can’t say any more about my opinions on this story without giving away the ending, so I’ll leave it at that. I’m really disappointed that I didn’t fall in love with this book. I bought this ebook for my own enjoyment.